Added on October 13, 2014 by Open Ephys. As of October 12, 2014, the new Open Ephys site is open to the public. Not only does it look a lot nicer and contain a lot more information than the previous iteration, but we now feature a variety of projects developed outside of MIT. We hope you like it! Added on September 20, 2014 by Open Ephys. Josh Siegle and Matt Wilson have authored the first paper based on data collected with the Open Ephys system. "Enhancement of encoding and retrieval functions through theta phase-specific manipulation of hippocampus" appeared in eLife in July 2014. In their experiments, Siegle & Wilson used closed-loop optogenetic feedback to alter behavior in mice performing a spatial navigation task. The Open Ephys software and hardware were designed with this type of experiment in mind. The lightweight headstage and cable did not impinge animals' movement, while the modular software made it simple to incorporate algorithms for triggering stimulation at specific phases of the theta rhythm. The experiments also incorporated a dual-site flexDrive capable of simultaneously targeting both sides of the hippocampus. 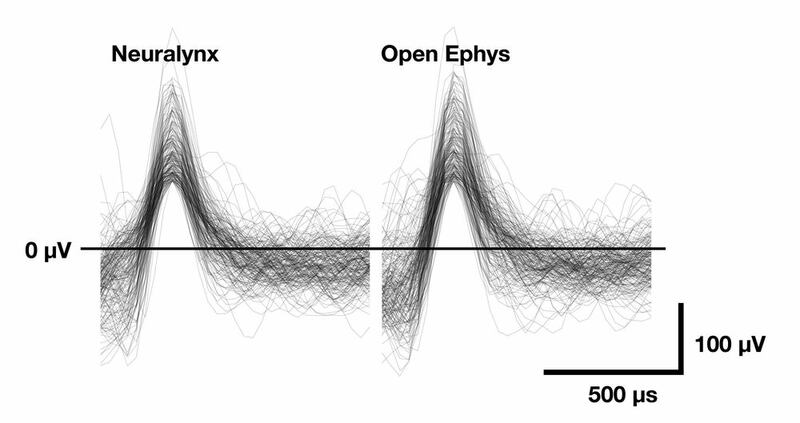 We're looking forward to many more papers based on Open Ephys data in the future! Added on July 18, 2014 by Open Ephys. A Q&A with Jakob and Josh was just published in a blog post on SparkFun.com, as part of their "Enginursday" series. This is a real honor, since SparkFun was an essential resource for us during the formative years of Open Ephys. Our first engineering project, the Twister, consisted of parts from the SparkFun Inventor's Kit before we turned it into a polished product. SparkFun's tutorials taught us a great deal about soldering, designing circuit boards, and general electronics know-how. We're proud to be featured on their site! Thanks to Toni Klopfenstein for making this happen! In the summer of 2013, Open Ephys kicked off its beta testing program by paying Advanced Circuits to assemble 50 of our acquisition boards. Generous donations allowed us to distribute most of these boards for free, which lowered the barrier to entry for those interested in trying out our platform. Based on the feedback we got from our beta testers, we made some improvements to the boards, then initiated a second round of manufacturing in spring 2014. Advanced Circuits produced 100 more boards for us, to meet the increased demand following our presentation at the Society for Neuroscience conference in San Diego. As of last week, all of these boards have been sent to their final destinations. Assembling 100 boards cost approximately $32,000, which included the price of the completed circuit boards, cases, and power supplies. Thanks to a donation of key components from Texas Instruments, we saved around $14,000 on parts. We shipped these boards to over 50 labs around the world, adding China, Korea, Belgium, Switzerland, and Finland to the list of countries using Open Ephys. In this round of distribution, there were three institutes that requested 10 or more acquisition boards each: University College London, the Champalimaud Centre for the Unknown in Lisbon, and the Donders Institute in Nijmegen. Along with MIT, where Open Ephys was launched, there are now four "hubs" in which our acquisition systems are concentrated. Having hubs like these will be important for increasing adoption, since scientists are more likely to try out new hardware that their neighbors are already familiar with. In total, we have now delivered over 38,000 channels of ephys recording capacity to the field. The first two basic science publications that include data collected with our platform are now in submission. We're looking forward to seeing many more in the future! When choosing an ephys system to buy, the availability of support is a crucial factor. Having a guarantee that faulty hardware will be replaced, or that someone will be available to help troubleshoot problems, often makes it worth the price of investing in a commercial platform. Since its inception, Open Ephys has successfully served its small user base entirely through volunteer efforts. But with the number of new systems about to come online, we decided it was time to hire an official support person. Leftover donations from the last round of manufacturing will fund a contract with Miguel Hernández University in Alicante, Spain to provide technical support for Open Ephys. The point person will be Aarón Cuevas López, a PhD student who has already contributed substantially to developing and testing our platform. Having Aarón as an official support person will make it easier for everyone to use our system. We'll continue to rely on the constantly growing community for adding new features, but it will be hugely helpful to have Aarón available for fixing bugs and responding to technical questions. We recently established an official partnership with the Champalimaud Neuroscience Program in Lisbon to manufacture Open Ephys acquisition hardware. This is the first time anyone outside of MIT will build our designs for distribution. Investigators at the Champalimaud—including Alfonso Renart, Adam Kampff, Leopoldo Petreanu, Megan Carey, and Zach Mainen—have been some of the most enthusiastic supporters of Open Ephys. We plan to produce 100 boards in Portugal in the next few months. Once these become available, we'll send out a newsletter with detailed information about how to purchase them. Another avenue for getting your hands on an Open Ephys acquisition board is through CircuitHub, a startup aimed at lowering the barrier to entry for obtaining custom hardware. If you order a board using this link, CircuitHub will purchase all the parts and assemble the circuit board for you. You'll still have to find a way to 3D print or machine the case; instructions for that can be found on our wiki. We haven't ordered anything from CircuitHub yet, but it could become the easiest way to order acquisition boards in the future. If you're interested in testing this out, please get in touch with us—we may be able to coordinate a group order. Stay tuned for more information about updates to the wiki and website, as well as the launch of the official Open Ephys store! We've been using the flexDrive (wiki) for over a year now in the Moore lab, recording almost 100 sessions in 5 mice. I'm just now starting to analyze neural ensemble statistics that require simultaneously recorded neurons. Here's the real-world distribution of how many simultaneous neurons in primary somatosensory cortex (with some thalamic electrodes) I could sort over a total of 75 sessions in awake mice with 16 nichrome tetrodes. 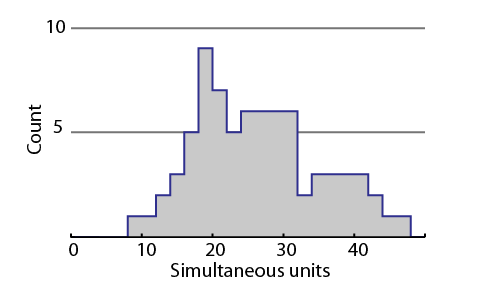 The mean unit yield was 25.8, with a minimum of 8 and a maximum of 46 units. These numbers include some not so great recordings, and bad tetrodes hat got damaged etc., but only very few sessions were outright discarded, mostly in the beginning of the drive lowering process where it looked like some electrodes were not in cortex yet. All in all, these numbers should be good enough to do some interesting assembly-analysis, though the relatively low density of the tetrode array (250 micron pitch) results in a relatively low occurrence of strong fast-timescale correlations between spike trains. Jenni Siegel from the Cellular Mechanisms of Working Memory group at UT Austin recently sent us some screenshots from her latest experiments. She's been using the Open Ephys acquisition board and GUI to record from M2 and anterior cingulate in awake, head-fixed mice. The tetrode projections (right side of the screen) show some beautiful units! So far she's been really happy with the data quality—the noise floor is greatly reduced compared to her previous recording system. There are a variety of opportunities to check out the latest from Open Ephys at the Society for Neuroscience conference in San Diego next week. Whether you're already using our tools, or just want to find out more about what we've been up to, we'd love to chat with you! Open Ephys acquisition boards are now being evaluated by over 30 labs as part of our beta testing round. So far, we've received great feedback from these users. Everyone that's tried it has reported that the system is easy to set up and yields high-quality neural signals. They've also pointed out software bugs and feature requests that have made our system more user-friendly and robust. Now it's time to spread the word about our tools, and hopefully recruit some new developers. Over the past two months, we've visited labs at the Karolinska Institute, UCL, NYU, Princeton, Harvard, and Cold Spring Harbor to discuss potential collaborations. But we expect to gain even more exposure at this year's Society for Neuroscience conference, which takes place in San Diego from November 9th through 13th. At last year's SfN, we presented a working prototype system that was very well-received. Many of you signed up for this newsletter after seeing our tools in New Orleans. This year, we have an acquisition system that we've already mass-produced, and that's being used by labs around the world. We're excited to show it off at our poster presentation, which takes place on Wednesday morning. It's poster number NNN33—we hope to see you there! This is the first year that Intan Technologies will have an exhibition booth at SfN. The Open Ephys system wouldn't be possible without the chips that Intan manufactures, and we're especially grateful for all the technical advice provided by Reid Harrison, the president of Intan. We encourage everyone to stop by booth #920, where our acquisition board will be on display. We're also organizing an informal meetup, which will take place on Monday from 5:00-6:30 pm at Neighborhood in San Diego. Anyone is welcome to join. We'll be discussing ways to grow our initiative in the short term, and how to sustain it over the long term. Finally, we're currently working out the details of the next round of manufacturing, which will take place in December. We'll make some small tweaks to the hardware (such as adding a port for synchronizing multiple acquisition systems), then have 50-100 boards assembled by Advanced Circuits. Stay tuned for more information...we'll send out a request form after the conference. Open Ephys recently reached an important milestone: our hardware has spread beyond the labs that developed it. Over the next few months, we'll get lots of feedback from our new users. We also hope they'll help us improve the software by fixing bugs and adding new modules. A list of the labs that volunteered as beta testers can be found on our people page. If you didn't receive one of our acquisition boards but are interested in testing one out, we now have a wiki page with instructions on how to build one from scratch. We've built a number of systems by hand with great success. We'd love to kick off another round of manufacturing, but we don't know exactly when that will happen. Keep an eye on upcoming newsletters for more details. The timing will depend on both how quickly things progress with our beta testing phase, and how long it takes to secure funding for manufacturing. The first 50 boards cost around $20,000 to produce, and we expect the next 50 will be the same. We still haven't figured out the best financing model, but donations have worked well so far. If you might be interested in funding our efforts, definitely get in touch. Eight labs contributed to the first round of manufacturing, in addition to the generous donation of parts by Texas Instruments. We don't feel comfortable selling our hardware without some mechanism for providing support, but perhaps this will become a possibility in the future. We're also looking for people to help with software development. Our platform is already at the point where it has all the functionality needed to carry out basic electrophysiology experiments and observe data in real time. We've been using the Open Ephys system on a daily basis for the past few months, and we're very happy with its usability. But there's plenty of room for improvement, especially when it comes to making the software easy to modify. The fact that it's open source already represents an advantage over the commercial alternatives, but we'd like to make it simpler to add new processing modules, even for those with limited development experience. If you work with a programmer that might be able to contribute some of his or her time, or have access to funds that could be used to hire one, please get in touch. We've been amazed by how liberating it feels to collect all of our data with open-source tools, and we'd like others to experience the same thing. For more information on what we've been working on, check out our blog and wiki. Last week we received 45 assembled acquisition boards from Advanced Circuits and placed each one in a cast urethane case. Needless to say, they're looking great! This week we received a shipment of five fully assembled Open Ephys acquisition boards from Advanced Circuits. 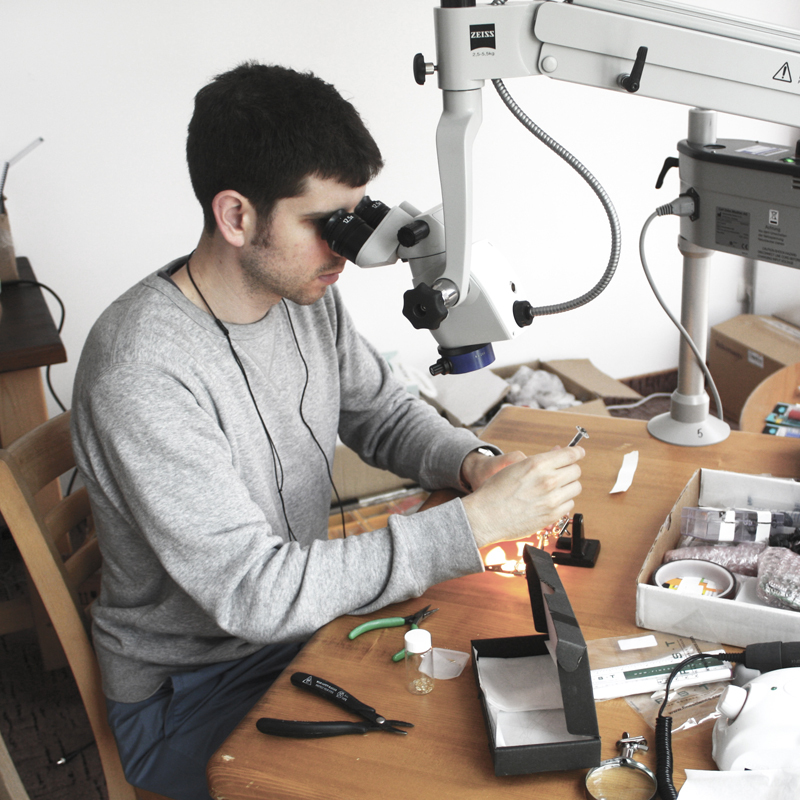 Previously, all of our boards had been assembled by hand, a process that takes 2-3 hours per system. In order to spread our tools beyond our labs, we needed to outsource the manufacturing. After running the boards through a battery of tests, we're happy to report that everything is working exactly as expected. We're now ready to order an additional 45 units, which we'll distribute to labs around the world for beta testing. One of the assembled boards, exactly as it arrived (except for the handwritten serial number). A stack of Open Ephys acquisition boards in cast-urethane cases. The next round of boards we make will have blue cases with translucent acrylic tops.